Free Shipping Included! 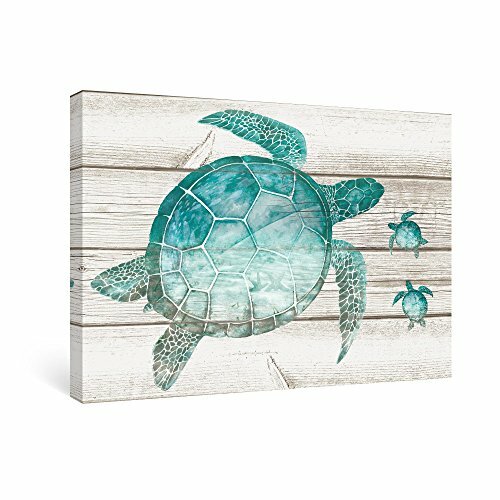 SUMGAR Wall Art for Bathroom Green Sea Turtle Wall Decor Vintage Paintings on Canvas Framed Prints by SUMGAR at HoldUp Art. MPN: 0117015903. Hurry! Limited time offer. Offer valid only while supplies last. ABOUT SUMGAR WALL ART: Since 2006, Sumgar wall art has been obsessed with one thing: providing customers with premium quality wall art anywhere. Sumgar has its own factory. According to the designs of its team, it makes products in different styles, including oil paintings on canvas, acrylic paintings, Mixed-media paintings, Watercolor paintings, Wood wall art. ORIGINAL WORKS, ALL RIGHTS RESERVED! It's exactly as described and is a great addition in my beach themed bedroom.-Tammee W.
FREE ACCESSORY:Screws included.If you can't put the obvious holes on the wall, hang them with the push pins or nails.The high-precision image is printed on canvas and it looks like real wood grain.